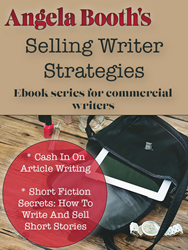 Angela Booth has published the second ebook in her "Selling Writer Strategies" series. The series focuses on the skills commercial writers need, so that they can become successful full-time writers today. Today, writers are faced with a huge variety of opportunities in self-publishing, content creation, blogging, and more. Unfortunately, this leads to confusion. Writers who want to make a good living from their writing, and writers who MUST make a career of writing, opportunity-hop. Instead of digging deeply into their chosen field, they find themselves writing for long hours for little income. Writers' confusion stems partly from the pace of change. There are no certainties, and a writer's favorite market can vanish in a blink. Newspapers and magazines are disappearing at an alarming rate, publishing houses, ditto. Angela Booth, who manages several blogs for writers, and creates writing classes, is producing a series of ebooks, "Selling Writer Strategies", to help writers to navigate the changes, and also, to capitalize on opportunities. She says: "My writing students find today's writing environment challenging. In many areas of for-pay writing, especially on the outsourcing websites, there's a rush to the bottom. Writers price their services so low that their incomes plummet. They're confused, and discouraged." Angela created the "Selling Writer Strategies" series to give writers practical strategies they can use today. She says: "I recently wrote a blog post on Fab Freelance Writing Blog about the mindset of writers who are very successful today. It surprised me that these writers were confident, even before they became successful. So I decided to create the series, to give writers confidence in their skills, as well as to alert them to new opportunities." Currently Angela has published two ebooks in the series, "Cash In On Article Writing", and "Short Fiction Secrets: How To Write And Sell Short Stories." Angela wrote the article writing ebook because content-creation skills are essential for all writers today, even for writers who write fiction. She says that many of her students' projects start out as articles. Her book on writing short fiction came about because she saw the success her students were having in using short stories to market their fiction. The first two titles in "Selling Writer Strategies" are available now. Angela can be contacted via her blogs, or via social media.